for ONE FLAT LOW PRICE!! One Price Dry Cleaners provide you with the HIGHEST quality of dry cleaning services for ALL valued garments — Only $3.95! stains, dirt, grime, and other undesirables so that your garments come out clean, undamaged, and ready for use! Inspect your garment(s) and label each one with a specific numerical identifier so that your items are never mistaken for another customer’s. Pre-treat all garments that need extra care to ensure stain removal. Apply Synthetic Finishing Agent so that each item looks like new! Post-Spot all items to affirm that all stains are removed. Finishing touches are made, pressing, grouping, packaging,etc. 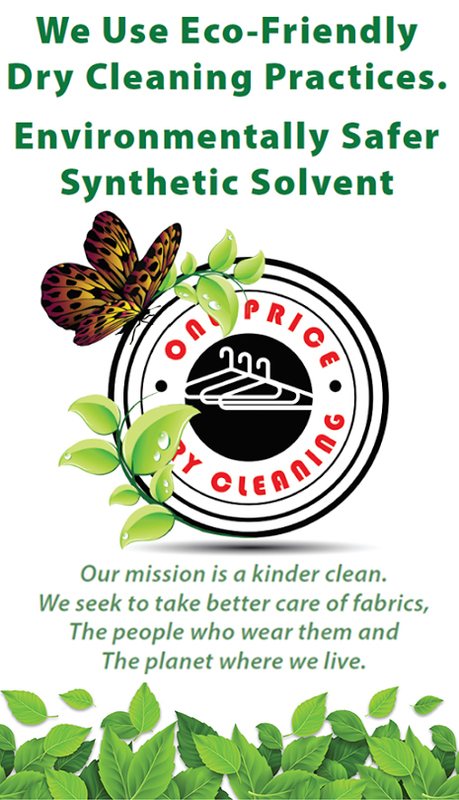 Dry Clean all items using a safe and reliable solvent. Directions: Bonita Beach Dry Cleaners From US-41, One Block West on Bonita Beach Road, Across the Street from Publix Plaza. Sounds Too Good To Be True IT’S TRUE!! One Price Dry Cleaners even offers Men’s Business Shirts Laundry service for just $1.99! Scared of Shrinkage? No Problem! Worried about Stains? We got you covered! You can trust in One Price Dry Cleaners for all your valued garments for $3.95! look better while maintaining original color AT NO EXTRA COST!